The pink powderpuff tree is in bloom again! I heard it was named after a guy named powderpuff who had very pink skin. 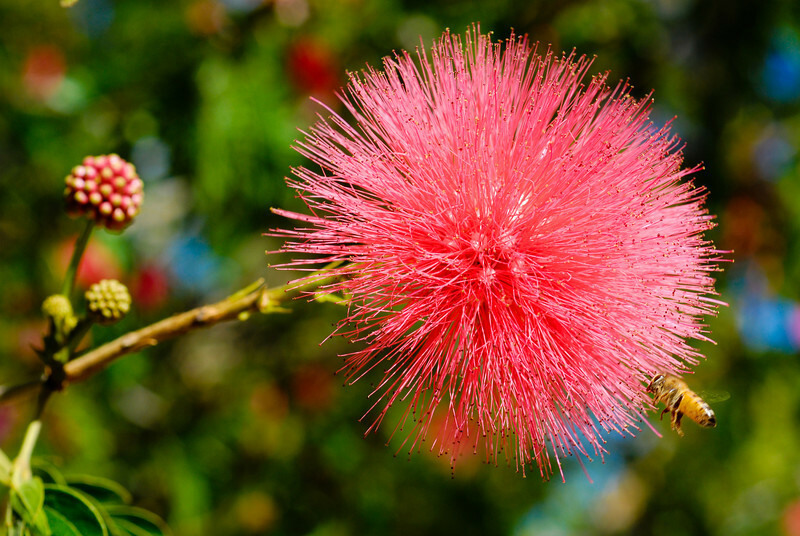 If you like technical details, the scientific name is Calliandra haematocephala and it's native to South America. I'm pretty happy with the bee in this photo. I stood around for a few more minutes hoping for another bee to come along, but it was quite hot in the sun. The midday lighting was pretty harsh, but I'm really happy with the way the background turned out. The blue splotches is the sky and the reddish splotches are more of these flowers. Beautiful shot and great detail. Beautiful shot! Wonderful detail and color. Way to go...even a bee stopped by to complete the image! Brilliant colors and nice background! Wow! This is stunning. bokeh is fantastic. Colors and details are wonderful. Good capture. The colors are very nice.